Connecticut Who Needs a Commercial Drivers License? To drive a Class A, B,or C commercial vehicle,you must have a Connecticut Commercial Driver’s License (CDL).These types of licenses (as well as whichever endorsements may be required) are necessary when operating double/triple trailers, passenger vehicles,vehicles marked for hazardous materials, and tanker vehicles. Class A License-This is required when Gross Combination Weight Rating (GCWR) exceeds 26,000 pounds (and provided that the vehicle being towed weighs more than 10,000 pounds). Class B License-This class is deemed necessary when the vehicle being towed does not exceed 10,000 pounds, or the single vehicle exceeds 26,000. Class C License-If a vehicle is placarded for hazardous materials, transports 16 or more passengers (including driver), and does not meet the criteria for Class A or B licensing, then this form is right up your alley! 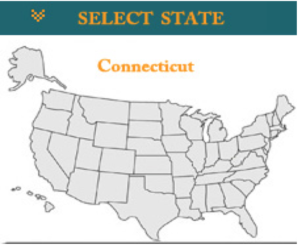 To qualify for a CDL in Connecticut,you must be at least 21 years old,have a valid Connecticut driver’s license, pass a vision exam and obtain a medical certificate. Applicants then need to take a general knowledge exam and a skills test.The three part skills test includes a pre-trip vehicle inspection,a basic vehicle control test and an on-road driving test.For the driving test,you must use a vehicle in the same class for which you are trying to obtain a CDL license–for example,if you wish to obtain a Class A CDL, you must test in a Class A vehicle. Class A:Any combination of vehicles with a gross vehicle weight rating (GWVR) of 26,001 lbs or more, provided the GVWR of the vehicle(s) being towed is in excess of 10,000 lbs. Class B:Any single vehicle with a GVWR of 26,001 lbs or more, or any such vehicle towing a vehicle not in excess of 10,000 lbs GVWR. Class C:Any single vehicle, or combination of vehicles, that does not meet the definition of Class A or Class B, but is either designed to transport 16 passengers or more, including the driver,or is placarded for hazardous materials. Many states make exceptions for farm vehicles, snow removal vehicles,fire and emergency vehicles,and some military vehicles.